Cosy Cats and Acorn Montessori have been working together on their second year of the Shared Education project ‘Sharing From The Start’. 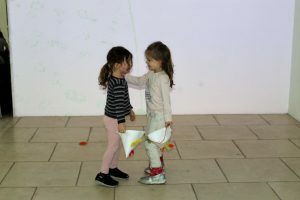 Staff and children have been visiting each other’s settings as well as taking part in a series of activities to enhance their learning and provide the children with new opportunities. ‘Sharing From The Start’ is supported by the European Union’s PEACE IV Programme, managed by the Special EU Programmes Body. 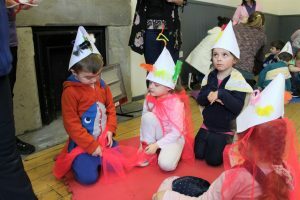 Funding enables pre-schools to take part in Shared Education projects improving educational outcomes and cross-community cohesion, inclusion and diversity. 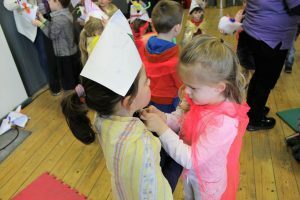 A number of neighbouring pre-school partnerships have been developed throughout Northern Ireland and the Southern Border Counties. 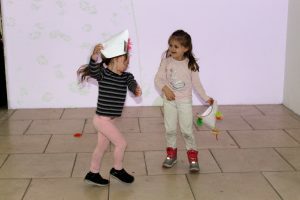 The curriculum focus of Cosy Cats and Acorn Montessori’s work together is music, art, citizenship and community connections. 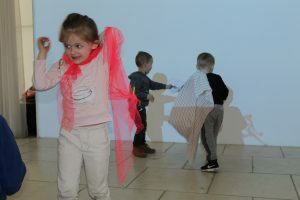 Recently they took part in an art project which was facilitated by The Model, Sligo, on the occasion of The Keeper, To Have and To Hold at The Model, in response to the artwork Here, by Connolly-Cleary, on view at The Model until April 14th. 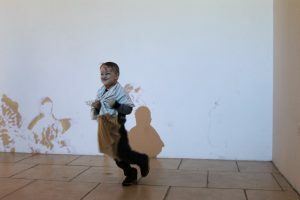 Children had the opportunity to take part in a workshop where they made costumes with a range of materials. 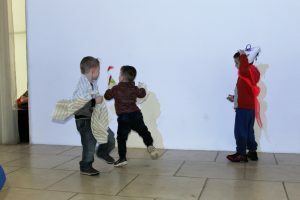 They then took part in a digital art piece exploring movement and colour, as their images were projected in abstract forms on the wall. 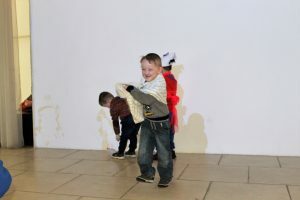 Later this term the two pre-schools will be visiting a dairy farm, the life boat station and Sligo Museum. They will finish the year with a joint sports day celebration. 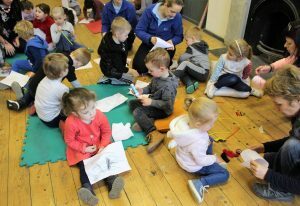 Kelley Sweeney from Acorn Montessori commented “Through Sharing From The Start we’ve been able to take part in these fun methods of learning which the children really enjoy.” Louise McLaughlin from Cosy Cats added “It’s great for the children to be making so many new friends. By working together we’ve been able to get involved more in the local community”. 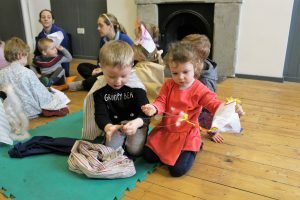 Administered by Early Years, working in collaboration with the Fermanagh Trust and National Childhood Network, the Sharing From The Start project aims to engage almost 10,000 pre-school children in shared activities on an ongoing and sustained basis by 2022. Together these three organisations have a strong track record and over twenty years experience of working for the benefit of children and community relations. Copyright © 2017 Sharing From The Start. all rights reserved.